West Bengal NEET State Quota Merit List: Health & Family Welfare Department, Government of West Bengal has published West Bengal NEET State Quota MBBS/BDS Admission Counselling Schedule 2018 on their official website. All NEET UG 2018 candidates of West Bengal state are eligible to appear in West Bengal state quota counselling. West Bengal Health & Family Welfare Department will conduct WB NEET UG 2018 to fill 85% reserved seats of MBBS/BDS courses. The online pre-counselling registration form was available from 19th June to 24th June 2018 on the official website of West Bengal Main Computerised Counselling (WBMCC). All candidates who are willing to participate in West Bengal state quota and Management Quota counselling 2018 have to log in the website www.wbmcc.nic.in and fill the asked details on domicile, caste status and PWD status as applicable and have to pay counselling Fees (which is non-refundable) online Rs 2000/- for unreserved category candidates and Rs 1500/- for SC/ST/OBC A/OBC B/PH candidates. Bank transaction cost extra to be borne by the candidate concerned. Quick Update 28/07/2018: West Bengal Medical Council (WBMC) will announce West Bengal NEET Merit List 2018 today after 04:00 PM on their official website. All registered candidates will be able to download it from this page after 4:00 PM. If any candidate doesn’t participate in Pre-Counselling, he/she will be debarred from the participated in Counselling process. After completing the pre-counselling procedure, the board will publish the merit list for MBBS and BDS courses on 28th June 2018 after 4 PM. Only those candidates will be eligible for the main counselling whose name will be displayed in the merit list. The first round of counselling will be started from 29th June to 3rd July 2018. All eligible candidates are advised to keep their documents ready in original format for the verification. All important documents will be asked for the verification just after the pre-counselling registration. Declaration of Vacancy if any will be done on 13th July 2018 and notification for further counseling if required will be done accordingly. Candidates are requested to visit the website frequently as no personal communication can be made. Candidates can verify their documents at RG Kar Medical College Kolkata/ Medical College, Kolkata/ IPGME&R, Kolkata. Remember, Candidate has to appear physically for the verification at the verification centers. Below we have listed all necessary documents that candidate has to bring originals and self-attested photocopy. Domicile Certificate as the case may be. Voter Card/Aadhar Card/Passport of parent/s in case of domicile certificate of the parent is given showing the address as West Bengal. PH certificate issued from IPGMER Kolkata (From Medical Board which started from 28th June 2018). Payment of counselling fees proof. Class 10+2 mark sheet for verification of marks and passing. Medical certificate (from Registered Medical Practitioner). For detail you can contact us on 9960887497. I got 406 in NEET 2018. I am from West Bengal, general category, can I get a seat in govt bds college in my home state? I got 307,sc rank 12600…can I get any chance in state quota in west bengal??? can i get mbbs west bengal medical college? I got 436 in obc B category. Can i get a seat in west bengal govt college? I got 415 in neet 2018. I am from west bengal, general category , can I get a seat in Govt MBBS College in my home state West Bengal. I get 274 marks in neet…can i get any medical college in kolkata? 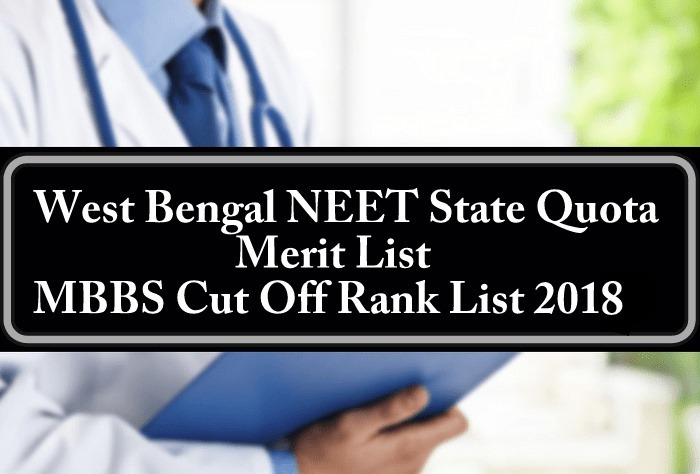 MY AIR rank in neet 2018 is 9757(UR)…What will my wb rank in state quota approx? I got 291 in neet 2018. AIR 15078 in SC Category. Can I got a Govt. College in a seat in my home State West Bengal? My AIR in neet 2018 is 37231(UR).What will be my wb rank in state quota approx? I got 393 in neet 2018 can i get any government medical college in my home state west bengal under state quota . I belongs to obc catagory.